This article was submitted by Todd Snyder in respect to the disccusion on the NDT.net Forum. 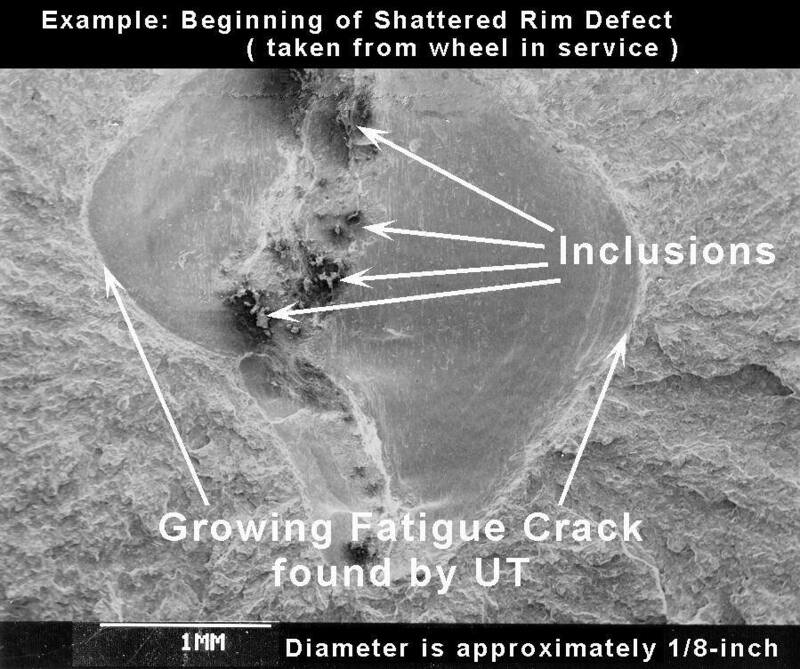 Shattered rim defects are bull's-eye shaped fatigue cracks which start from an internal defect such as an inclusion (see photograph, left) and usually grow until a chunk of the wheel falls off (see photograph ,right). The number of shattered rim defects occurring in one coal car fleet since 1997 prompted an investigation into the cause. The coal fleet was built with new wheels during 1994 and 1995. Wheels in this fleet were manufactured by various manufacturers. There have been 12 documented shattered rim defects in this fleet since 1997 and all have occurred in two manufacturer's wheels. Ultrasonic tests were performed to compare these suspect wheels with those from other manufacturers. These tests showed that there was a much higher incidence of defects for the suspect wheels. Ultrasonic testing (UT) of eight shattered rim wheels which have been sent to the Union Pacific Railroad R&D Lab showed a total of 108 defects easily detectable by UT of the tread. Twelve of these defects were classified as being larger than 1/8-inch in diameter (the AAR specification limit for rejection on new wheels). 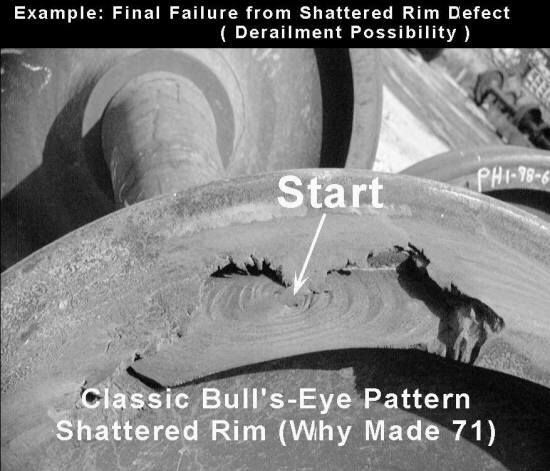 The type and number of defects found in two manufacturer's wheels made in 1994 and 1995 warrented a field procedure for ultrasonic testing and removal of those wheels, thereby lowering the shattered rim failure rate experienced by the coal car fleet. Only one of the eight shattered rim wheels tested at the Lab was devoid of detectable inclusions. 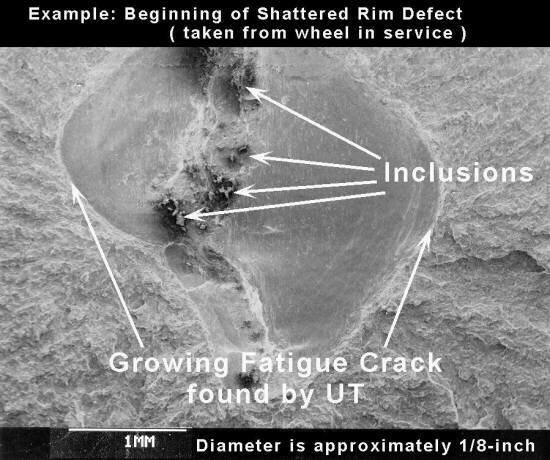 The remainder of the shattered rim wheels at the Lab contained either a defect classified as larger than 1/8-inch diameter or at least 6 detectable defects under the tread surface. Field testing at the coal fleet's home shop was done to determine a reasonable ultrasonic testing procedure. Ultrasonic inspection of wheels there proved that only the two suspect manufacturer's wheels in this fleet contained appreciable numbers of detectable inclusions near the tread, and of these, most contained one or two small inclusions and about 20% contained four or more defects, some larger than 1/8-inch in diameter. The field procedure which was developed and is now being used calls for scrapping wheels with a defect classified as being larger than 1/8-inch in diameter, wheels with four or more detectable defects of any size, or wheels which contain two or more defects within 1-inch of each other. These two manufacturer's wheels manufactured in 1994 and 1995 are now required by the AAR to be removed and scrapped by anyone not using a UT procedure to check these wheels. For this application we used a 1/2-inch square DU style dual element 5 Mhz probe with a Krautkramer USN 50. We tried other state-of-the-art equipment but this was the first instrument we found which was fast enough to make manual scanning of the entire surface feasible. We required all railroad wheel inspectors to have a section of wheel with a standard 1/8-inch diameter flat-bottomed hole drilled to within 1-1/4-inch below the center of the tread (oriented like a shattered rim initiation). The gain on the instrument was set such that the reflection from this manufactured defect gave a full-scale indication. There seems to be a strong correlation between the ingot position from which the wheels were forged. Many of the shattered rim wheels at the Lab were traced by serial number to the position in the ingot and 70% of those came from the center section. Five wheels are forged from each ingot and wheels coming from the center position account for 20% of the wheel population. Since March, over 1200 wheels have been inspected at the home shop and approximately 20% have failed the UT criteria.